Get the POWER and Larger Cleaning Surface for those big jobs without the noise! The Whisper Wash “Ultra Clean” Surface Cleaner combines the machined precision balanced spray bar and light-weight powder-coated aluminum housing with a wide 20” surface coverage area to provide a comfortable and highly efficient flat surface cleaner. This surface cleaner is built tough to save on labor, fuel and water consumption. 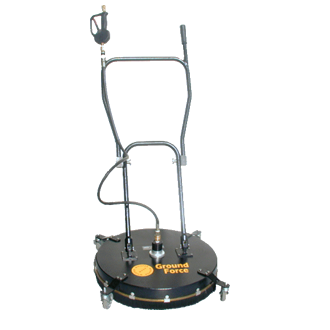 The Ground Force’s pivoting wheel design and a heavy-duty nylon brush provide for easy navigation through large areas while preventing overspray and “Zebra Striping”. Blast Off Equipment is south florida pressure washer superstore and service center. We carry the leading pressure washers powered by Honda and equipped with the best pumps by General Pump. Blast Off Equipment also carries a complete selection of electric pressure washers, Hot & Cold Pressure Washers, Auto Detailing Equipment, Custom Trailers, Airless Paint Sprayers and a wide variety of pressure washings Accessories, pressure washer hoses, pressure washer nozzles, pressure washer pumps, pressure washer extension wands and more. We are also service all of our equipment at our West Palm Beach Service Center. Let the experts at Blast-Off Equipment Customize your pressure washing trailer or auto detailing trailer to fit your business. We also specialize in chemical sprayer equipment for Lawn Maintenance, Pest Control, and Agriculture. Copyright 1978 - 2019 Blast Off Equipment. All rights reserved.